Happy Thursday everyone, I hope you are all having a fantastic week and I am personally very excited that the weekend is almost upon us. I thought the time change would help but I have to admit that I am still feeling sluggish. It might be time for some serious R&R for this gal. For today’s post I am sharing another fabulous piece from the brand Gatsby Lady, which are the wonderful creations of designer and owner Roj. 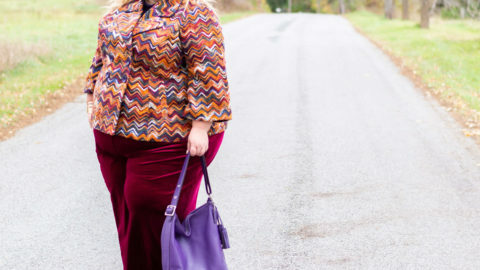 Roj is one of the nicest women you will ever meet and truly embraces dressing women of ALL sizes from 0US to 26US and anything beyond that can be custom ordered. 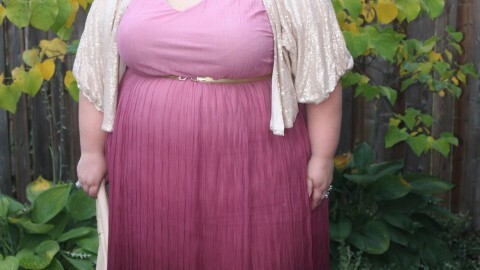 As a point of reference I am able to wear the 26US because these dresses are made true to size and they have stretch. You see Roj has the experience to understand all aspects of design and manufacturing. She worked in factories when she started out and she really focused on learning everything she could about sewing and pattern making. She also obtained a MSc degree in Fashion from one of the leading universities in Great Britain. After spending time working in high fashion she launched Gatsby Lady and focuses now on making designs she loves. Her aesthetic is definitely reflective of that by gone era of the roaring 20’s and a world of glitz and glam. I could honestly stare at one of her pieces forever. The intricacy of the beading and the patterns that are created are mesmerizing. Not to mention that it is all hand sewn! But at the same time there is an ease to wearing to her garments. The lining is stretchy and very comfortable and you can easily sit in the piece, you don’t feel like you can’t breathe which can be common with formal dresses. I can’t believe its been almost a year since my first post featuring this fabulous brand and when I saw this particular dress on their Instagram page back in May it was a I must have this moment. I will admit that this colour combination might not be for everyone but you all know how much I love colour and this unique piece grabbed my attention and tugged at my heart strings. Plus size women have been told to wear black for years because it is slimming etc. so while times have changed it can still be hard to change your mindset and it can still be hard to find options that are unique and not your typical black. It reminded me of something that I would see from a straight size brand and be disappointed because it didn’t come in my size. But with Gatsby Lady I never have to worry! Thankfully Roj was happy to indulge me and my vision for this dress. So Roj, I hope you love these pictures as much as I do! With the colours of the dress and the dramatic qualities I wanted to have the beauty of the water and sand as the backdrop. To me this would be a beautiful option for a destination wedding and yes that’s right, it also comes in white. The way the light picks up the beading is absolutely gorgeous. It’s quite difficult for me to find a form fitting gown that fits me properly because of my pear shape. But this one hugs my curves perfectly. And the beading is strategically placed so that it emphasizes your shape and curves. I mean the placement on my booty? I couldn’t believe it! It has a little bit of a train but it is still easy to walk in. I am not wearing shoes here but I would recommend a simple metallic so as to not take away from the dress. I am 5’6 so you would be able to wear a normal heel height. Also remember that part of the length of a dress like this gets taken up by the size of my booty. I really wanted to play off the blue beading with my accessories so I went on a hunt for all things blue. The earrings are from Eloquii but they are sold out. Thankfully Bauble Bar has the almost identical pair and the cobalt blue is still in stock. Because of the intricate details of the neckline a statement earring is the perfect choice for this dress. But I think it shouldn’t be too crazy in size or again it would take away from the dress and not compliment it. And this bangle was a total score from my one of my fave local online accessory shops, Symone Kelly. I found Symone when I first started blogging and she has a knack for finding some unique pieces. I also find that her pieces are plus friendly. I love the statement that this bracelet makes with this dress. And the colour matched perfectly. It also comes in rainbow colours and I think I may need to add that to my Christmas wish list. Finally there is my clutch. The funny store about this piece is that I knew I wanted a blue clutch and I was shooting the look on a certain day and I didn’t have a lot of time to go and search my usual haunts for something in this specific colour. And yes believe it or not, I did NOT already have one in my vast collection, SHOCKING lol. So someone suggested to me that I try Amazon. I have to admit that I haven’t really gotten on the Amazon bandwagon yet when it comes to fashion etc. but I thought ok I will give this a try. And needless to say I was proven wrong because I found so many amazing choices. I focused on finding one that had Prime eligible shipping and ended up with this beauty. I was really impressed with the quality for the $40 Cdn price tag. Unfortunately it is sold out in this colour right now but I did give you a link for an equally amazing similar choice. With the holidays just around the corner, now is the perfect time to check Gatsby Lady out. If you do, I promise you won’t be disappointed. And in the end you will be supporting a brand that truly gets size inclusiveness which is no small feat in the fashion industry. Thanks to Katie of Katiuska Idrovo Photography for taking these beautiful photos and trekking to the beach with me for this one. WOW! That dress is so detailed! I love all the embellishments! The yellow is a great shade. Gorgeous! Love the dress and the accessories! This amazing dress is SO so beautiful on you! I think the colors are great on your fair skin and the beadwork is stunning. I can’t wait to look at the rest of their selection.